I was born in Stuttgart, Germany in July of 1946. My father was an American soldier, and I grew up on Army bases in the United States and Europe. I started kindergarten in Heilbronn, Germany, and then the first grade in Heidelberg. Eighteen years later, I graduated from Frankfurt American High School in Frankfurt, Germany. In between, I attended ten other schools in Missouri, Kansas, and California. In 1967, when America began turning against itself over the issue of a place called Vietnam, somewhere on the other side of the world most people couldn’t find on a map, I was a sophomore at Indiana State University in Terre Haute, Indiana. My response was to drop out of school and enlist in the U.S. Army. I entered the service on 8 January 1968. My basic training was at Fort Dix, New Jersey. I was then sent to Advanced Individual Training (AIT) at Fort Polk, Louisiana, where I learned to accurately aim and fire 60 mm and 81 mm mortars. I graduated with a military occupational speciality (MOS) in light weapons. I then went to Jump School at Fort Benning, Georgia. I made my first jump in June of 1968. From there I went to Special Forces Qualifications in Fort Bragg, North Carolina. I successfully completed all phases of training and graduated with a MOS of Operations and Intelligence in May of March of 1969. While in training in Fort Bragg, I heard about MACVSOG (Military Assistance Command, Vietnam, Studies and Observations Group), which conducted reconnaissance and related operations behind enemy lines inside Cambodia, Laos, and North Vietnam. I also heard that a certain Mrs. Alexander at the Special Forces Desk in the Pentagon was the person to contact for a SOG assignment. So, after graduating, I called Mrs. Alexander and asked to be assigned to MACSOG in Vietnam. She readily agreed. I arrived in Vietnam in April 1969 and was sent to Command & Control Central, FOB 2, in Kontum, located in the tri-border of central Vietnam; that is, where the common borders of Vietnam, Cambodia, and Laos meet. Upon my arrival in Kontum, I was assigned to the Company “A” of the camp’s Hatchet Force. The Hatchet Force was SOG’s strike arm, quick-reaction platoons and companies that attacked NVA installations and seized cache sites when recon teams discovered them. By the time I arrived, Hatched Forces were also conducting search, locate, annihilate, and monitor (SLAM) operations, which were basically recon-in-force operations. Then, toward the end of 1969, someone somewhere thought it would be a good idea to have some sniper operations as well. So, I was sent to the Sniper School conducted by the 25th Infantry Division in Chu Chi, Vietnam. There I learned how to be a sniper. When I returned to Kontum, I was sent out on “sniper missions” with both recon teams and the Hatchet Force. I did this for several months. In March of 1970, I extended my tour of duty for an additional six months. I went home on an extension leave, and returned to Kontum in April of 1970. After my tour of duty, in April 1970, I was returned to the United States and discharged from the U.S. Army with the rank of Sergeant E-5. I then finished my undergraduate college education at Loyola University of Los Angeles, graduating in 1973. From there I attended Loyola University School of Law, graduating in 1976 with a Juris Doctorate degree. Since that time, I have been in the private practice of law in the Southern California area. My practice has been focused on both civil and criminal litigation. 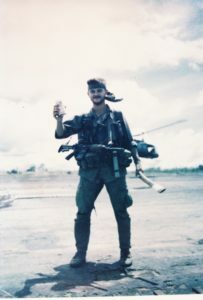 As far as Vietnam and my service in MACVSOG are concerned, I am proud to have served with the heros in whose midst I found myself, so young, so courageous, and so stalwart. As painful some of my memories are, the nineteen months I spent over there had a profound impact on my life. Since returning, not a day has gone by that I haven’t thought about my experiences in Vietnam, and all the many friends that I lost.